Professor Bill McGuire works at the University College London. His article „Potential for a hazardous geospheric response to projected future climate changes” (2009, see) attracted attention of Reuters. McGuirre also mumbled (see): "Maybe the Earth is trying to tell us something.” Let me guess. I think Mother Earth is trying to make McGuirre think why we have (or actually DON’T have) an earthquake season every single spring when the snow and ice thaw and the first flowers pop out of the soil. After all the difference between the ice levels in winter and summer in the Arctic is much greater than the difference between the average ice levels between now and thirty years ago. In another article we can read about the amazing discoveries of another super scientist. 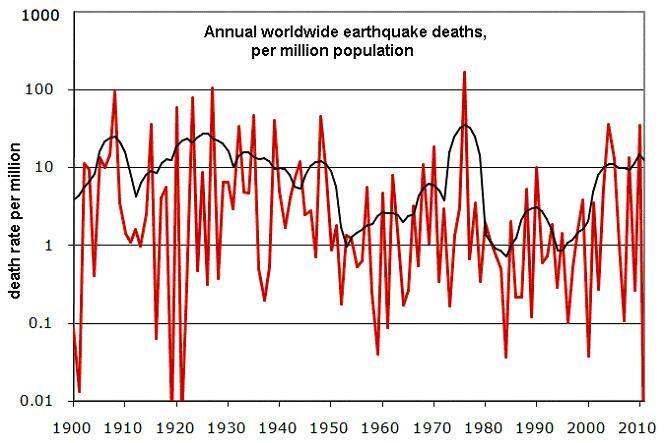 The new research by the Australian scientist Dr. Tom Chalko shows that the global seismic activity is now five times stronger than it was 20 years ago. 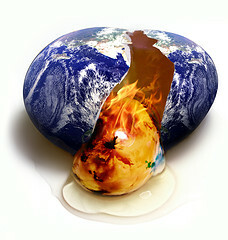 And the scientist adds: “Increase in the annual energy of earthquakes is the strongest symptom yet of planetary overheating… … Unless the problem of global warming (the problem of persistent thermal imbalance of Earth) is addressed urgently and comprehensively -- the rapid increase in global seismic, volcanic and tectonic activity is certain. Consequences of inaction can only be catastrophic. There is no time for half-measures." Meaning what? The air that has warmed by 0,7°C on the Earth surface over the last century is somehow bringing the planetary bowels to the brink of explosion? Hey, but I though the Earth core has thousands of degrees Celsius? Does oh point nothing really matter? But isn’t all that just a false correlation? How can we find out? Easy. Just compare longer period to see if the correlation holds. So let us have a tour of the US Geological Survey website. 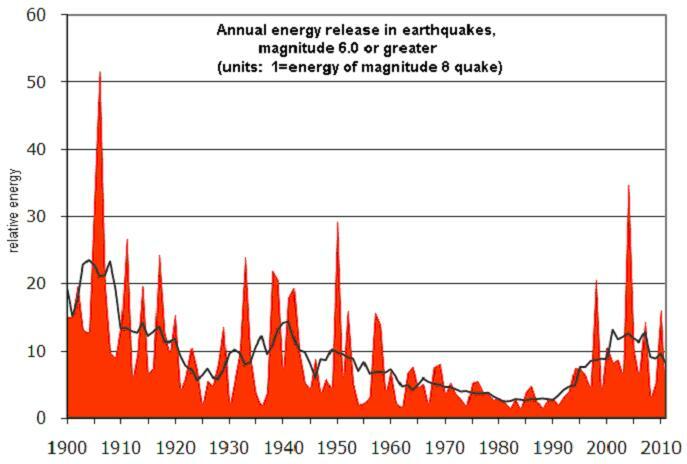 First I recommend reading the “earthquake myths“. 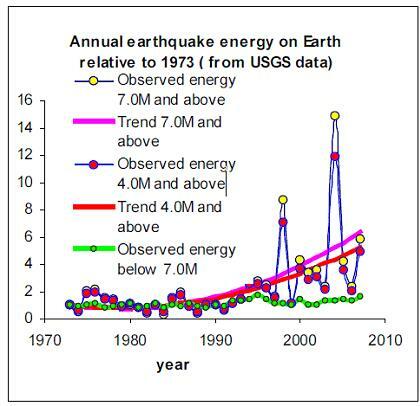 If we check the facts, we an see the increase of CO2 and temperatures has been correlated with a… DECREASE of the earthquake magnitude.